Fender Super-Sonic low resale value? Discussion in 'Amps and Cabs' started by arothamel6360, Feb 17, 2012. 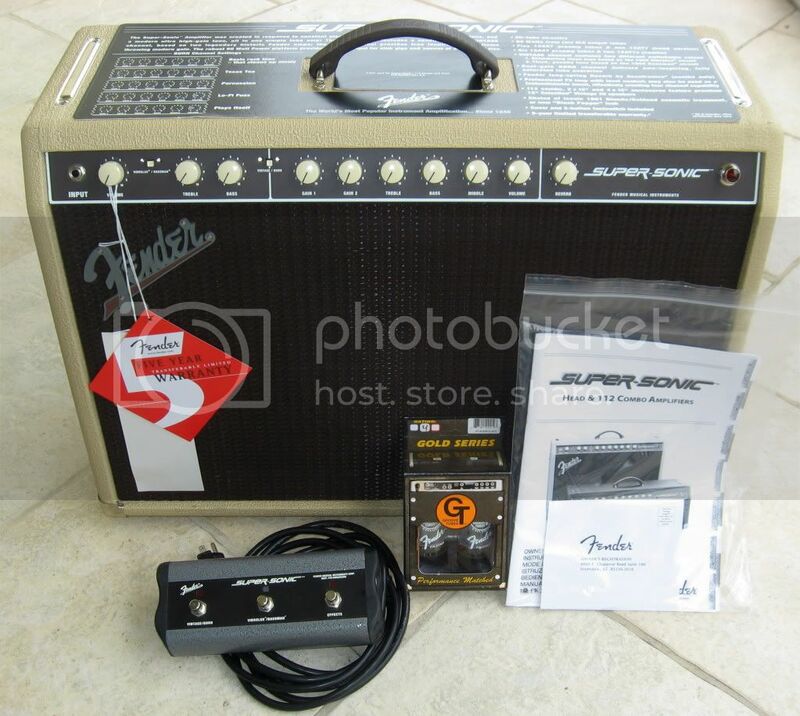 I'm just curious why the resale value of a Fender Super-Sonic is so low? I used to own a head and cab and I remember paying $850 for both. My girlfriend bought me a combo because I loved it so much and it was $600. Google is showing these things selling new for $1400. What gives? Is there some defect I'm unaware of? I paid $1,100 for mine a few years ago. Sold it last summer for $400 - totally mint with hang tags and upgraded tubes. I saw several go on ebay for $750 the week before I put mine on the block. I ran mine for weeks with no hits and I kept dropping the price each week. I sold it to pay some medical bills following a motorcycle accident. Any specific reason why it's overvalued? I'm more interested in unbiased opinions/logic than what appears to be personal dislike for the amp itself. I wish I had been around to buy that one from you. Not a bad amp, just not spectacular imo. Shrill highs, a relatively boring overdrive, noise problems and reliability issues killed the prices on these. I thought a Vintage 30 was a poor speaker choice. A Cannibus Rex would make the cleans less shrill, but the overdrive is pretty much useless to me anyways. Fender needs to try harder. That's why I sold mine. But I did buy a Super-Sonic 22 and I'm getting quite a bit of mileage out of it. A totally different sounding amp. One of these days I'm going to try the Super-Sonic 60 MkII. Supposed to be sweeter with more bass. Shrill eyes and woolly bass too. Hard to dial in mids. Doesn't sound like either of the amps it features as modes. Just all around not a great-sounding amp for me. wanted to love it....played one 20 minutes and never even looked at one again. what a shame. When Fender replaced the original Super sonic with the Super Sonic 22, which most players prefer, it killed the value of the original. Also, they are overpriced when new. It's a simple formula.... high priced as new for the advertised versatility plus more used ones on the market = lower resale value. I think these are good amps, but what I am finding more and more is that the majority of folks who buy these are Fender guys who are tired of pedals, trying these out to see if they solve the problem of having a single "clean" amp plus several pedals to get various sounds. sounds reasonable...leave the pedal board at home, haul just the amp/guitar/cable to the gig, makes life much easier, right? Most of the time, it fits-the-bill at first, but then the former pedal-dudes start to realize that they still need a pedal for this or that (delay, chorus, etc... perhaps a nice boost pedal), and eventually realize they still want pedals and the amp wasn't quite as versatile as their old setup, so the opt to go back to the really-perfect-for-their-tastes clean amp and a just add the overdrives back to their pedal board. Overdrive and distortion pedals are far easier and cheaper to swap out when tastes change and when the band picks up a few songs that require a different sound. So, the "versatility factor" shifts back to pedals, rather than a multi-channel amp. That formula usually means a glut of used ones on the market which brings the prices down. Couple that with Fender running the price up over the past few years for all their amps, and you end up selling at 50% or so, when it's still in mint condition. Do an Ebay search and you'll have your answer. The reason for the low value, if it truly does have a low value, is because there are a ton of them on the market. Supply outweighs demand. Why that is is up for speculation. That said, I just did a search and the cheapest I found was $750 shipped. I've never tried one myself. They either saturate the used market (devaluing Fenders pricing), Or Fender priced them "better" than they sound and people find out... a common practice with the rest of their amplifier line, imo of course. I completely agree that Fender overpriced them, along with most of their other recent amplifiers. I just didn't really feel the used market was so saturated with them that their prices would plummet. That said, they show up locally all the time right around $700 and are gone pretty quickly. Not a bad amp, per se, IMO. However, as someone who's owned a '73 Vibrolux, and I have spent a lot of time with just about every era vintage Bassman...this amp misses the mark. If it really did hit Vibrolux and Bassman territory in the clean channel, it'd be worth the price of admission for just the cleans. I've got two of 'em. The one I put EVM 10Ls into sounds spectacular. I had one for a while and loved it but I ended up having to swap it to replace a stolen guitar. That thing really was great. Any reason it was discontinued? I agree with you there. To my ears it doesn't really capture the tone of either all that well, though the cleans do sound good. I feel like the cleans are almost great, but there's just something missing.